The launch of both the Cycle the O’Keefe event and the O’Keefe Rail Trail Marathon event for 2017 took place in Bendigo on 9 February. The well attendance audience was provided with information about the overwhelming success of the 2016 marathon events, plus the inclusion to the 2017 marathon of a number of cycling events, by Event Director Sandra Slatter. 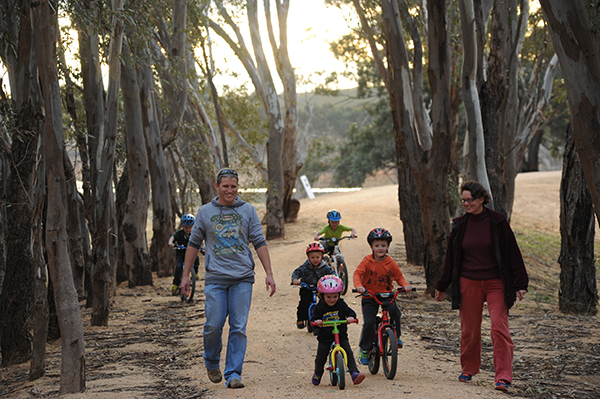 Families enjoying the O’Keefe Rail Trail at Lake Eppalock. With the launch of the newest event focused on the O’Keefe Rail Trail, ‘Cycle the O’Keefe’, this is sure to benefit from the popularity of cycle tourism and cycle events as well as encouraging event participation by individuals, families and the communities of Heathcote, Axedale and Bendigo. Combined with the already successful initial O’Keefe Rail Trail Marathon, these two events have the potential to be major flags on the event calendar for central Victoria plus highlighting the O’Keefe Rail Trail as an iconic trail.